Five years ago, Takuma Sato made a silly mistake and crashed on the final lap of the Indianapolis 500 while trying to pass for the lead and it cost him a shot at winning the biggest race in the world. On Sunday, the Japanese driver made amends as he took the lead from three-time winner Helio Castroneves with just over five laps to go and then drove flawlessly the rest of the way to get the win. The victory made Michael Andretti – who never won the 500 as a driver – a winner again as an owner. As Sato, Andretti and the winning team partied in Victory Circle, Castroneves stood chatting with team owner Rogers Penske. “I want to get the fourth one,” the Brazilian native said. “Don’t get me wrong, I’m going to try, but unfortunately, you guys saw it, it was a little bit hard with the (lack of) power. Rookie Ed Jones of Dale Coyne Racing finished third in a 500 that featured a very scary wreck, numerous smaller wrecks and a spate of blown Honda by potential race winners; a group that included F1 driver Fernando Alonso and former 500 winner Ryan Hunter-Reay – both of whom led lots of laps. Max Chilton finished fourth and former winner Tony Kanaan of Chip Ganassi was fifth. The first quarter of the race belonged to Andretti Autosport as the Hondas of Alexander Rossi and Alonso exchanged the lead several times in the first 50 laps. Sitting behind them much of the time was teammate Sato. The first wreck of the day occurred on Lap 54 and a scary one it was. Jay Howard hit the outside wall in Turn 2and came across the track. Scott Dixon slammed into Howard’s car was launched into the air, cartwheeled in mid-air and came down upside down on the top of the inside SAFER barrier. The rear portion of Dixon’s Chip Ganassi Racing care tore free just behind the cockpit. Dixon and Howard walked away from the wreck. The gearbox, rear wheels and half shafts from the Chevrolet engine skidded across the track and slammed the outside wall. The cockpit portion of the car skidded back onto the track. “I’m a little beaten up,” Dixon said after emerging from the infield care center. “It was definitely a rough ride there. I’m bummed for the team. We had a great shot (to win). The wreck ended an up-and-down Month of May for Dixon who won the pole for the 500 and then had a gun put to his head during a robbery at a fast food joint near the track. For Howard, there was anger. Also lucky was Castroneves of Team Penske as Dixon’s car sailed over the top of Castroneves and slammed to the ground just behind. The race was red flagged for almost 20 minutes to clean up a huge debris field, what was left of the two cars and also to repair a huge hole in the catch fence on the inside of the track. The yellow flag waved again when Conor Daly of A.J. Foyt Racing touched wheels with Charlie Kimball and then clipped the wall on Lap 67. Over his radio, Daly apologized to his crew for instigating the wreck. Also taken out during the incident was Jack Harvey, who hit debris from the wreck and lost control. During the yellow, several drivers, including past-IndyCar champion Will Power and Castroneves – who was penalized for jumping the previous restart – of Team Penske and Max Chilton, pitted while the leaders stayed out. Hunter-Reay become the third Andretti driver to lead the race when he passed Rossi on Lap 79. 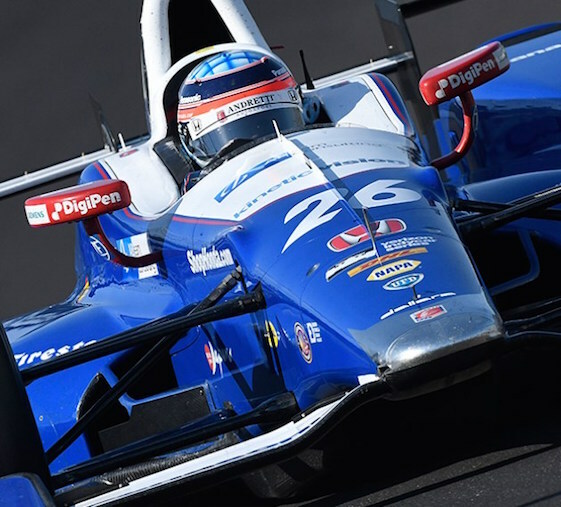 Two laps later, the caution flagged waved for debris – the left-rear winglet on Marco Andretti’s car flew off and onto the track – and the leaders pitted. That put Power, who pitted out of sequence earlier, in the lead. On the restart, he was passed by Chilton for the lead. On Lap 87, back came Hunter-Reay to regain the lead. On Lap 91, Rossi blew past Hunter-Reay for the lead. On Lap 97 – three laps from the halfway point – Castroneves, on an alternate pit strategy because of his penalty, passed Hunter-Reay for the lead. On Lap 104, Castroneves pitted and Rossi took the lead. About Lap 113, pitting began for the front-runners. Rossi went in first from the lead. When the pitting had cycled through, Hunter-Reay led and was followed by Rossi and Alonso, who were 3-plus seconds back because of slow stops. On Lap 122, Buddy Lazier, 49, lost control, spun and hit the wall in Turn 2 to bring out another caution. The caution was extended when Sage Karem’s car rolled to a stop on the track with a dead battery. On the Lap 130 restart lap, Alonso moved to the lead. A lap later, debris brought out another caution. A lap after that restart, Hunter-Reay moved back to the lead. Alonso came back to grab the lead but shortly afterward, Hunter-Reay, the 2014 winner of the 500, blew his Honda engine to bring out another caution. He had led the most laps to that point. With 61 laps to go, Alonso led most of the field into the pits. He had a smooth stop but teammate Rossi did not as his team had fueling problems and then he stalled the car. On the restart with 58 laps to go, non-stopper Chilton led and had eight others who did not stop behind him. Then came Alonso. On the restart lap, the yellow waved again Ed Carpenter suffered front end damage when he turned into the car of Mikhail Alyshin. Restarting with the lead with 52 laps to go was Charlie Kimball, one of those who did not stop the prior caution. Chilton was second and J.R. Hildebrand third. Leading the group that did stop with 61 to go was Castroneves, who was ninth. A lap later, Chilton took the lead. With 33 laps to go, Chilton pitted from P1. Just after he left his pit stall, Kimball, who was running third, blew a Honda engine. That put James Davison into the lead but virtually the entire field pitted. Castroneves came out of the pits first but was third on the track as Chilton had the lead and Ed Jones was second. The two drivers who set the pace for much of the race – Alonso and Rossi – restarted ninth and 15th respectively with 29 to go. With 21 laps to go, Alonso’s bid to win his first Indycar race ended when his Honda engine expired. He was running seventh at the time. As he go out of his car on on the front stretch, the two-time Formula One champion was given a big ovation by the Indy crowd. “It’s a shame,” the Spaniard who drives full time for the McLaren Honda team in F1, said. “We deserved to at least finish. The race restarted with 17 laps to go and with Chilton leading, Sato, who had stormed back from a bad pit stop during which his crew dropped a wheel nut, second. Third was Castroneves while Jones was fourth and Oriol Servia fifth. Before the laps could be completed, a big wreck occurred coming out of Turn 1. It took out Servia, Power, Newgarden, Davison and James Hinchcliffe. The wreck began when Davison, subbing for injured Sebastien Bourdaid in the No. 18 Dale Coyne Racing entry, wiggled and made contact with Servia. The race restarted with 11 laps to go. With seven laps to go, Castroneves passed Chilton for the lead and it looked like Indy might have a four-time winner. But the lead didn’t last long for Castroneves as he was jumped by Sato. Castroneves took a shot or two at getting the lead back but on the final lap, Sato retained control and got the victory. Verizon IndyCar Series point standings: Castroneves 245, Pagenaud 234, Sato 234, Dixon 234, Rossi 190, Kanaan 188, Power 186, Newgarden 186, Jones 185, Hinchcliffe 170, Chilton 170.